Eight is a magical age, deserving of a magical party. My daughter picked unicorns for her birthday theme this year and it was too fun! We had no shortage of sparkles, darling friends, and enchantment. I LOVE planning birthday celebrations for my children. Today I'm sharing the details of this sweet party, broken down by category. It was all kinds of pink, purple and sparkly for this party... too fun! I found the little signs at Zulily and Prep Obsessed. I picked up the little unicorn cake plates at Walmart. I adore these floral arrangments from Costco. For $19.99, they are beautiful and easy! I always do custom napkins for my kids' birthday parties. The party took place after lunch time, so we just did some simple snacks, lemonade, and of course birthday cake. I found the napkins at Homegoods and the plates at Target. The cake is from Sugar Bakeshop in Denver and was absolutely gorgeous. It was vanilla with caramel filling and so delicious! These unicorn straws make me so happy! We had about two dozen kids for this party so I had several activities to keep them entertained. Of course we HAD to have a unicorn bounce house! These little unicorn wand kits are from Oriental Trading and proved to be an enjoyable craft. Second grade girls LOVE to color, so I found this free image on Pinterest and we printed them on cardstock. I've learned to keep party favors simple because no one likes their kid coming home with a bag full of tons of tiny junk. Am I right?!? When the guests walked in they could choose a unicorn horn. Each child left with a favor bag holding a little plush unicorn and either a pen or necklace. I found the custom labels here. It's always a joy to choose and birthday theme with my children and plan their parties. When else in life can you wear a unicorn headband and eat cake? This post contains affiliate links, which means I might make a small commission if you buy something through a link. This is no extra cost to you. My son just turned 11 and he is just so hungry. All the time. He's a bottomless pit. So when he suggested a pizza theme for his birthday party I thought it was perfect! We started with these invitations and it just got more fun from there. This was a family party, since our family is a party in itself! We had the most delicious vanilla cake with caramel filling from Sugar Bakeshop in Denver. I love all the pizza toppings around the side! I always order personalized napkins for my kids' birthday parties. For the tables I used a combination of pizza decorations, things I had on hand, and pizza supplies from the grocery store. 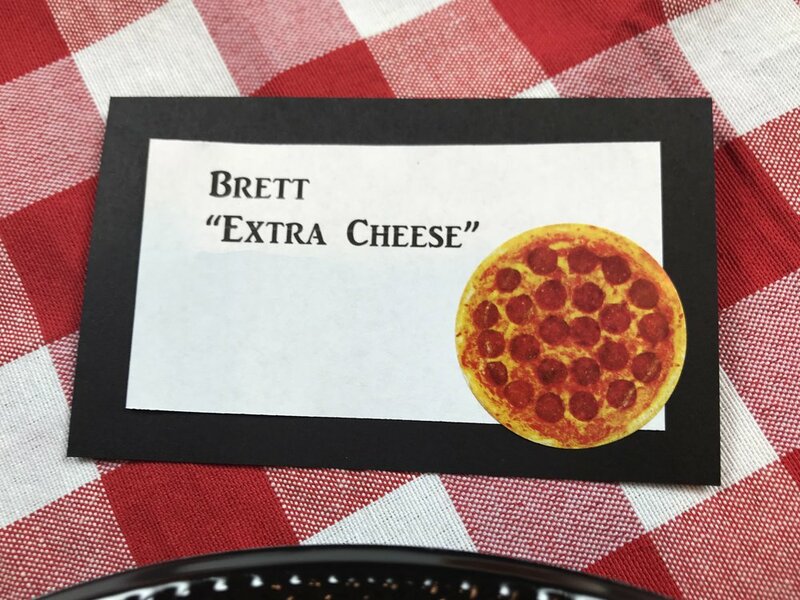 At the last minute I decided to make place cards and give everyone a pizza-themed nickname. I edited out the last names but you get the idea! The coffee bar had lots of birthday love too, including pizza string lights. Dinner could not have been easier for this one. I just ordered from our favorite local pizza place and added a salad. I picked up little craft kits from the Valentine's section at Hobby Lobby. The kids all took a long time coloring and creating these and they turned out super cute. For favors we did pizza keychains, necklaces and sticker sheets. Custom stickers on cello bags wrapped these up nicely. It was a delicious party for the boy who made me a mom and has a huge pizza my heart!